After installing the Android plugin for Eclipse, Eclipse should have prompted you to restart the application. If it did not prompt you, restart Eclipse now. Restarting Eclipse will ensure that the program has a chance to reinitialize with the plugin installed. It is important to make sure configuration steps like this are followed in order to reduce the chance of misconfigurations. 1. From the main Eclipse window, choose Window | Preferences. 2. In the Preferences window, shown next, select Android in the menu on the left. On the right side of the window, click Browse, find the location of the Android SDK on your hard drive, and enter it in the SDK Location field. Eclipse needs this information to be able to access all the tools that are supplied with Android, such as the emulator. 3. 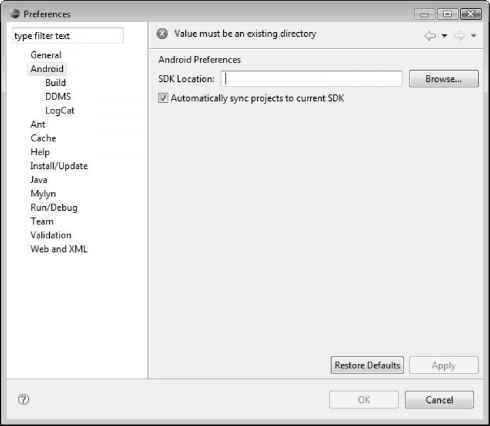 Check the Automatically Sync Projects to Current SDK check box and then click Apply.